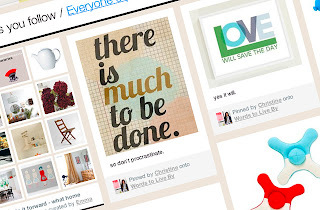 Pinterest is an online visual bulletin or pin board that allows users to gather or "pin" images on the Internet to categorized boards thus organizing them together on a themed page. The images retain the original URL of the web page from which the user pulled the “pin” creating a visual bookmark for future reference. Other users can “repin” or "like" your images to their boards then share them to Twitter or Facebook, which creates a viral link-sharing environment. The invite-only website began in March 2010, as a way to manage or curate an inventory of images on the Internet. First growing popular with Etsy crafters, mom bloggers and designers, the website’s popularity has grown to 421 million page views according to Mashable. 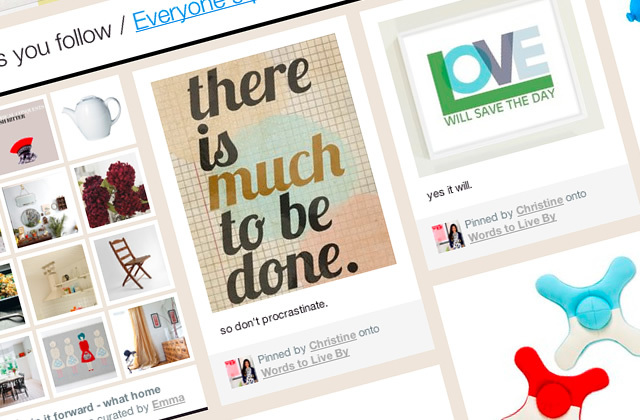 Some popular pin board categories include wedding ideas, home decoration, crafts, recipes and fitness tips. I started using Pinterest a few months ago and quickly became addicted to the visual sharing aspect of it, as well as the bookmarking capability. It can be a great go-to when in need of ideas or creative ways to do just about anything. - Zales: The jewelry store has some interesting boards of what else? Jewelry! The company also switches it up a bit with a board for “Favorite Quotes” and another of love songs called “Sounds like Love." Not only is the company advertising their own products, but they are adding value by sharing romantic visuals that could be associated with jewelry. - Whole Foods Market: The grocery store known for organic and natural food products, has 493 pins of seasonal recipes for different times of the year, along with dinner or dessert ideas. Additionally, the company’s boards reflect edible art displays from around the world, recycling ideas and pins of Whole Planet Foundation. According to Whole Foods’ website, Whole Planet Foundation “is a private, nonprofit organization established by Whole Foods Market.” The Foundation funds “grants to microfinance institutions in Latin America, Africa and Asia who in turn develop and offer microenterprise loan programs, training and other financial services to the self-employed poor.” This is an example of how Whole Foods uses Pinterest to not only share recipes using products from their stores, but also to spread the mission of their nonprofit foundation. - Cabot Cheese: Run by Cabot Creamery, a family-owned farm cooperative located in the hills of Vermont produces all-natural cheeses. On their Pinterest boards, the company pays homage to farmers and farms, their state of Vermont and the cows that produce the milk to make their cheese. To me, this helps to tell a brand’s story and humanize the everyday production for consumers. Other ways businesses can utilize Pinterest include, adding the “Pin It” widget to their website so users can easily pin website images and/or follow a company-branded board. Gina Rubel has done an excellent job of adding value by pinning relevant infographics for PR and communications professionals, as well as link sharing of events that she supports. Check out her boards here: http://pinterest.com/ginarubel/social-media-and-marketing/.